The DLLR PUB/OUI 6116 is a health insurance law poster by the Maryland Department Of Labor, Licensing and Regulation. This is a mandatory posting for all employers in Maryland, and businesses who fail to comply may be subject to fines or sanctions. This poster must be posted in a conspicuous place where all employees will see it. This poster describes how an employee might be able to get covered by their former employer's health insurance policy for a limited amount of time as well as who to contact to receive further information. It appears you don't have a PDF plugin for this browser. 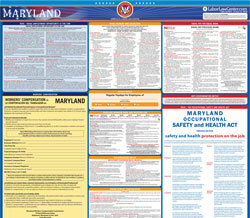 Please see the link below to download maryland-healthinsposter.pdf.   You do not have other similar insurance. Baltimore at (410) 468-2244 or 1-800-492-6116 (Ext. 2244). THIS NOTICE APPLIES TO STATE LAW. YOU MAY HAVE BROADER BENEFITS UNDER FEDERAL LAW.